Creating a shipment is the required step to close out or complete an order (unless the order has been cancelled). By providing a carrier and tracking number, this information is transmitted to the retailer so the customer is notified that the order has shipped. Follow these steps to create a shipment in the Portal. 2. 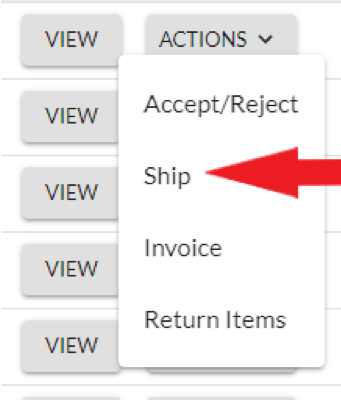 On the Order Management page, click on Actions and select Ship. 3. You will be taken to the Create Shipment page. This is where you will create a shipment for an order. There are two key pieces of information required to create the shipment: Carrier and Tracking. From the Carrier drop-down menu, select the carrier used to ship the item(s). 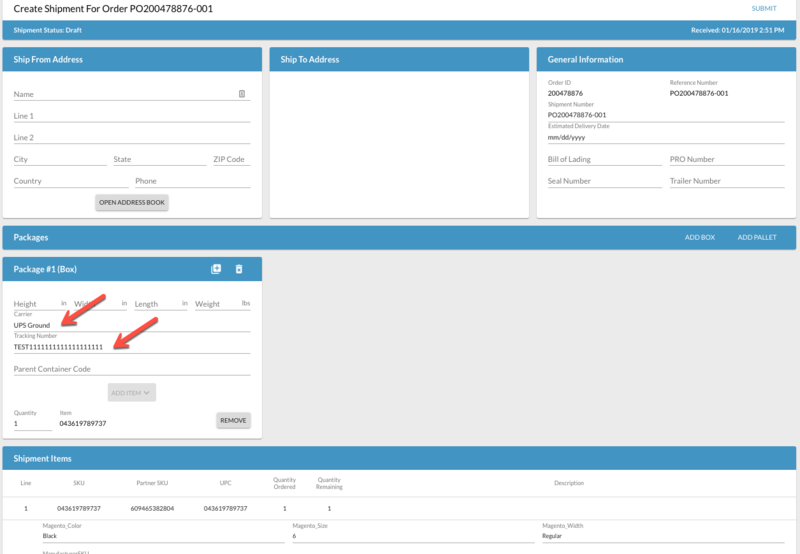 If the shipping method isn't visible in the drop down, you can type any approved SCAC code. You can see the standard list for Logicbroker under Settings --> Shipment Options. The shipping method used should typically match up to the shipping method requested on the order. For example, if UPS Next Day service was requested on the order, the expectation is the order would ship with next day service. In the Tracking field, enter in the tracking number for the shipment. For Items, make sure the items and quantity match to what was in the box shipped. All other information on the page is optional unless otherwise requested by the retailer. When finished, click on Submit (top right corner of the page). There are times when you will need to split the items of an order into more than one box. 1. From the Create Shipment page, you can click on Add Box. The Add Box link is clicked anytime you need to add a box. If you need 3 boxes, you click it two times to create two additional boxes beyond the original box we automatically generated for you. When a new box is created, you need to select the appropriate item(s) from the Add Item drop down Since we auto-populate the first box with all items (since a vast majority of items go into a single box), you will need to click Remove next to the item(s) that won't be in the first box. IMPORTANT: Essentially, make sure each box has the item(s) that are included with that particular tracking number. 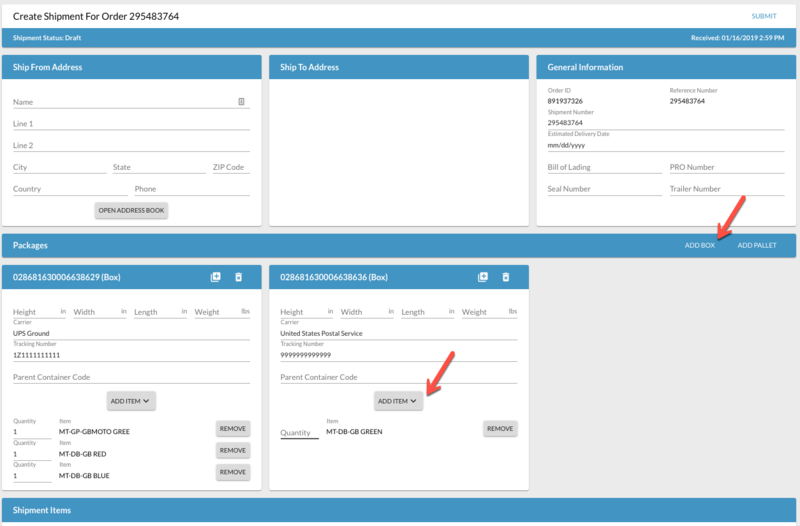 Because shipment data is usually sent frequently to the retailer throughout the day, make sure your shipment data is 100% accurate before clicking on Submit. The ability fix a mistake is very limited and could have a negative impact on a customer.